Today's the day, I've been waiting for all year...it's National Mutt Day! A day to celebrate all the wonderful doggie blends out there and to call attention to adoption. Why adoption? Because just about 75% of all dogs in shelters are mutts, mixed breeds or blends, whatever you prefer to call us, and these sweet pooches are all in need of a loving home. The goal of National Mutt Day is to get 10,000 dogs adopted nationwide, both today and on December 2. The number will put a nice dent in the shelter populations, while those humans adopting will gain a loyal, loving family member—a win-win situation if I've ever heard one! 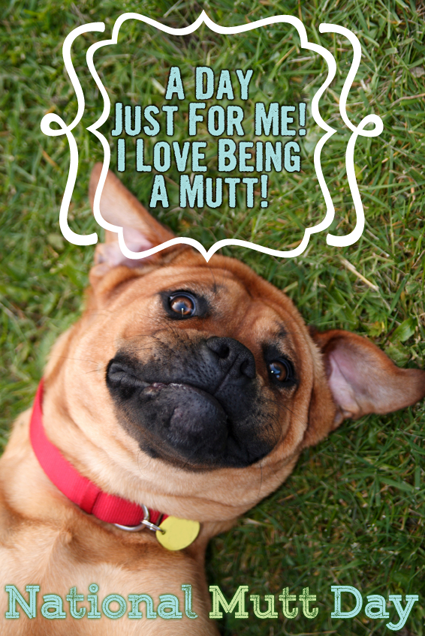 To read more about National Mutt Day and what you can do to help this worthy cause, check out DogTime Media's article on today's big day, or visit the National Mutt Day website. Thanks for all you do to help animals in need! Happy National Mutt day to you Bocci. Have a tremendous Thursday. Happy National Mutt Day to you, Bocci! We hope you have something really yummy to celebrate! Parental Unit just ordered lots of new treats from Mr. Chewy, and I've already started my celebration!